Home › Uncategorized › Don’t Forget A Bright Whitened Smile As You Plan To Walk Down the Aisle! If you’re in Austin and hearing wedding bells in the distance, preparation for that BIG DAY is your top priority! Arranging a caterer, finding the dress, fitting into the dress, booking your hair and nails appointment; the list goes on and on. From the pile of bridal magazines you purchased to daily email notifications from subscribed websites, all are constant reminders that your time is ticking down (as your list is piling up)! Here at Dr. Brian F. Scaff in Austin, we want to help ‘de-stress’ your schedule and check off one of those items on your list. AND AT THE SAME TIME, DO SOMETHING GOOD FOR THE WORLD. From now through June, we want to help you prepare for your special day by offering professional teeth whitening services with 100 percent of the proceeds going to childrens’ charities. Dr. Brian Scaff and team here in Austin are partnering with Discus Dental (makers of professional teeth whitening products) and the Smiles for Life Foundation to donate all of our time and materials to charity. Anyone in Austin and surrounding areas can get this great deal on professional teeth whitening. Whether you’re the bride OR the groom, you and your wedding party will look stunning with pristine smiles, helping create the images of a magnificent wedding! 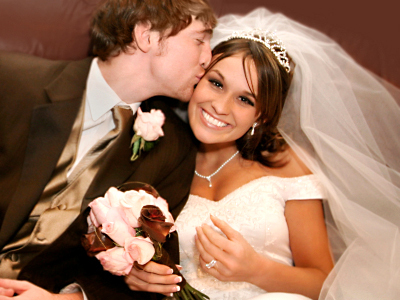 SEND EVERYONE IN YOUR WEDDING PARTY to Dr. Brian Scaff and have them all whitened! What a great gift and ‘thank you’ to those who are sacrificing their time to be part of your special day. Because your time is so precious right now, you can make an appointment to whiten your teeth with just one simple click of a button (to the right). Dr. Brian Scaff and team in Austin will help you achieve those dazzling smiles! Thanks, in advance, from the underprivileged children you’ll be helping! …And, congratulations on your wedding!